So do you feel that POW mining is dead? Since you are such a huge supporter and fan of ION. If POw mining is dead, why are you mining ethereum? Also, what aspects of the coin make it so revolutionary from the coin it was cloned from. What has this question got to do with XPY / GAW / my tweets? This is irrelevant. Are you kidding me??? You just asked for reasonable conversation and you are going to avoid this question? Unbelievable. So you are intentionally dodging these questions then? It linked to your own thread on hashtalk. If you're saying your source was yourself then you made it up. Why would you link back to a forum owned by an obvious scammer of the tweet wasn't an attempt at discrediting the "fudders"? It really shows your true character. Ha! It was a link to your own thread! Ha ha ha! You keep digging yourself deeper and deeper...keep going, PLEASE! This is great!! Is there an old copy of hashtalk up anywhere on another domain? The source will be in that post if it was my post. I was never a primary source of any information, and never claimed to be. CryptoBuds: Remember, at the time, I didn't realise it was a scam. So no, I was not knowingly linking back to an obvious scammers forum. P.S. How long does it take before I don't have to wait 360 seconds between every post? Yesterday Paycoin was hit by another negative news release but it didn't have the usual effect. The fabrication of the story contents/images was so poorly constructed that it throws into question all prior articles, even to the most hardened XPY detractor. The price was dipping until the story was released and then price rebounded unexpectedly. Could this be because the story did not have the anticipated effect on market value? What happens when the SEC write back to Josh/GAW and say "Thank you for complying with our informational requests and assisting us with our enquiries. We are pleased to announce that we have found that your organisation is not in breach of any SEC regulations. We wish you the best of luck with your venture." Can you imagine what could happen to Paycoin market price? Could it be that we are now invested in the first coin to be "APPROVED" and given a "Clean bill of health" by a major government agency? What do you think could happen when this day arrives? Are you ready for it? Spread the word! People are starting to worry out there that this might happen! Yup, I believed all the crap I read. Big mistake. Cost me a lot. Lessons learned. It was a scam. Yet you're doing the same thing with ION. So you're either making stuff up again, or have inside information that makes you ignore the red flags. Which is it? And your relentless cheerleading cause many other to lose money as well. Just read the quote suchmoon just posted of you. You are telling people outright that everything is fine. And they bought bought bought on that advice. But yes, you are the victim here. Again: Being a HUGE supporter of ION, could you explain why you feel POW is dead? If you feel POW is dead, why do you mine ethereum? Also, what revolutionary features does ION have that the coin it was cloned from not have? "What happens when the SEC write back to Josh/GAW and say "Thank you for complying with our informational requests and assisting us with our enquiries. We are pleased to announce that we have found that your organisation is not in breach of any SEC regulations. We wish you the best of luck with your venture." 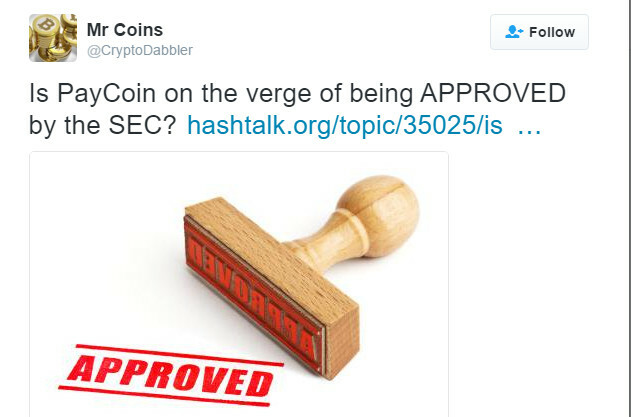 "Could it be that we are now invested in the first coin to be "APPROVED" and given a "Clean bill of health" by a major government agency?" AH! Suchmoon beat me too it. Either then, you didn't believe all the crap you read. YOU MADE UP THAT SCENARIO. It was fabricated by you. It had no reference to reality (and the SEC doesn't do anything of the sort anyway, as people told you with references in your twitter and you yet you still argued you were correct. You can't ask for "reasonable discussion" and then proceed by evading and then eventually blatantly denying what we can PROVE you actually did. He has inside information, he paid to be considered a whale. Another feature of Garza - pay to be more important than others. Take a moment to check out my twitter... It looks nothing like what I did for MOON, MINT, BOOM, BLACKCOIN and XPY (and some other coins). To be fair you can't really expect him to incriminate himself here. The goal is probably the opposite - to skew the historic context. BTW... MrCoins, did you get banned on talkxpy? Shows as "Guest". Suchmoon, I appreciate the discussion and the way you have conducted it. I (finally) no longer hold any XPY and have quit the TalkXPY forum.